I suddenly noticed I haven’t posted anything on the blog since January. I am not sure why. It is very possible that I don’t like the premise any more. The playlists take forever to make and it is hard to tell if they are used at all. So what else? Most of my spare time I spend in Second Life. I like Second Life. I know about it. So why not write about it. My history, my experience, my ups and downs with it. So here goes with a bit of how I came to where I am today in world. Internet has been a part of my life for almost 20 years. It has evolved a great deal since the beginning with the analogue modems and slow connections to now where it is high speed, 3D and always online. 10 years ago I started chatting online. It was fun and I got to talk to people I would not have talked to otherwise. I made new friends, some I met in the real world, some stayed online friends. Some I still connect with today, and some are long gone. 4 years ago I heard about Second Life on The Chillcast, and in March 2007 I created my first avatar. The first couple of months in SL I spend finding my bearings. Navigating a virtual world is not so easy, and finding people to talk to was not easy either. Once I had learnt to walk, fly and teleport the world was my ouster. I found that a way to meet people was to go dancing and attending live music performances. When Lovespirals released their album Motherless Child they performed a concert in Second Life. That was magic. Even if it did mean that I had to get up in the middle of the night to attend. 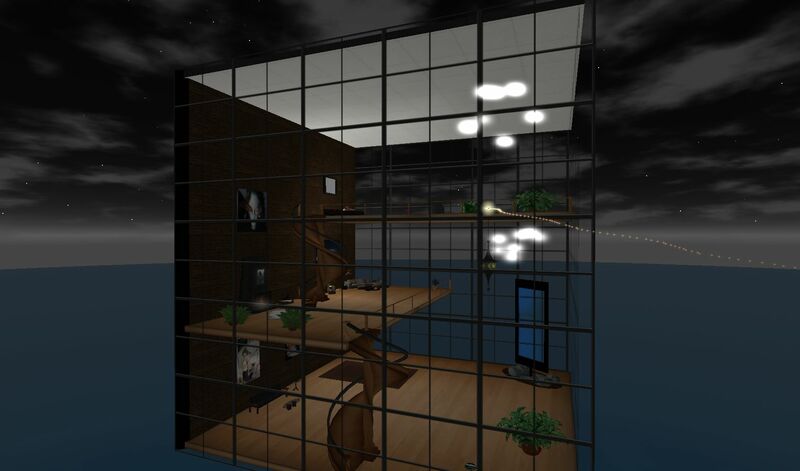 7 PM SLT (Secondlife Time) is 4 AM my time… But it was worth it, and I was kinda high from the experience. I got to go to a concert I would never had been able to attend in real life (they have their life in Southern California), and I got to talk to the performers after the concert. I even befriended Anji Bee. That was grand. After this music started playing a bigger role in my Second Life. But I would still feel a bit lonely some times. There are a lot of stuff you can do in SL as a couple, so I tried to get my husband involved. He logged in a couple of times, but even with my guidance he never got the bug, so eventually I took over his avatar, which meant that I could log in with both avatars and see what all the couple stuff was about without involving strangers. Sometimes that is preferable LOL!!! I found a nice place to hangout beginning of 2008. The Lost Garden of Apollo. I would do Tai Chi with a bunch of others and listen to the music and chat to the others. It is funny to look at these pictures again. A lot of SL stays the same, but the graphics keep evolving. These old snapshots seem so flat now. The first 15 months I spend exploring the many worlds of Second Life. There was so many places to see, but not really many people. In summer 2008 I stumbled upon a club, The Wandering Star. The music was really good, and the people there were so nice and I felt welcome and I soon found some good friends there. For a long time The Wandering Star was my home and the people there were friends and some of them like my family. I started DJing at the Wandering Star. I met up with some of the people from the Wandering Star in Hamburg in the summer of 2009. It was a magic time, and it showed me how close you can grow to someone in a virtual world. But things got a bit tense between the club owner and me and I had to leave the Wandering Star. So you can make great friends, and you can also fall out… Just like in the real world. But leaving The Wandering Star didn’t stop me from loving and having fun in SL. I made other friends, started DJing in other places, and made a myself a second life. I got my own beach for a while on Taniz where I DJ. It was fun, but it seemed silly to share the skybox with Michaell and have a beach on my own, so I left the beach and Michaell and I got a beach together. I hope to post stories from SL. I read somewhere that blogging is mostly about being true to yourself. Let your persona shine through. That should be interesting as I write this as an avatar in a virtual world. But on the other hand, most of what I do and what I say in SL is true to my real person and who I am in the real world. So I hope I won’t do too bad.